We do not responding to reservation until April 30, see Description below. This is our family summer home for over 85 years, and our family has first options. We do not consider responding to reservation until at least April 30, 2019. We did rent out our Lake house for some 7 weeks in 2018 from June 8 to September 30, and we will mostly likely do the same in 2019. The fee per week will most likely be in range of $1400 to $2200 depending on what week. If this is what you are considering, let me know if you have any questions after April 29, and we can talk in more detail. There is a beach and boat launch area on the property. 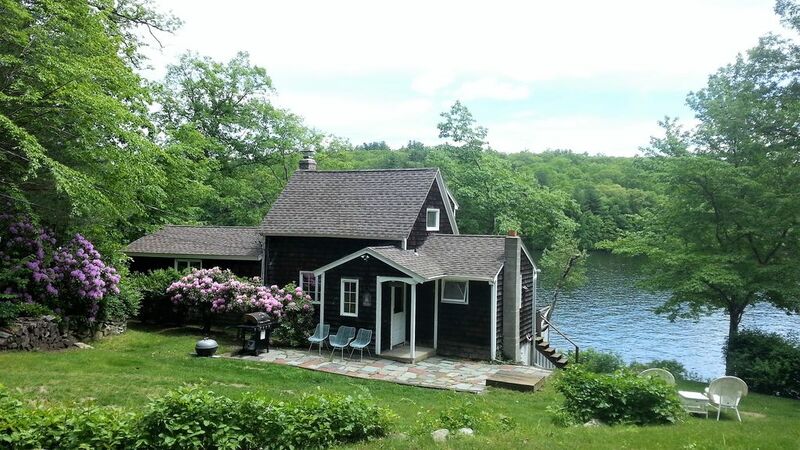 Private and peaceful lakefront home is 40 miles to Boston, with 300' on a lake, a dock, small sandy beach for children, and boat ramp for your own boat. Winter Rentals: Begin around Nov. 3, 2018, must be booked until at least April 15 but leave by May 30, 2019. The house is on a point of land offering lovely views from the two decks and a screened porch of the lake. The 1st floor BR has a comfortable double bed and the large 2nd-floor bedroom has 3 twin beds as well as a foam pad. In the den, there is a fireplace, HD TV, DVD, internet access. There is a window A/C that can help on hot days. The kitchen has new appliance in the last year, and there is a washer and dryer in the bathroom. Forty feet in front of the house is a dock with the water depth of about 9 feet at the end, great for swimming, fishing, and boating. In addition, there is a small sandy “beach” area, with a gradual slope, great for young children. There is a rowboat, canoe, paddle boards, and boat ramp for your own boat on the property for your convenience. Being at the end of a dead end road, we have a great feeling of privacy with 2.7 acres with 300' on North Pond. Abutting the property is a 500 acre Peppercorn Hill conservation area with many walking and mountain biking trails. The lake's surface is about 234 acres which have an average of 9 feet deep feet. We see an abundance of birds: including many ducks, a Great Blue Heron, and swans. For three generations this has been our family summer home, and our family has the first options however for the last 15 years have been sharing it with others. North Pond, has been in our family since 1930, when my grandfather had bought in the Great Depression. Ever since it been and still a place where our families have to relax and been nourished. For the last 20 years, we have rented to others during the winter months and part of the summer, since we are able only to be there for about a month. Renting has enabled us to make a number of improvements and allow others to be blessed. Please look after this home as if it were your own. We want you to enjoy your time at the Lake while also respecting the property and our efforts to keep it a clean and comfortable place to be! Also, please be mindful of the private single family community you are in. Though this is a private setting, is not a "party house". About 150' from the house there a small beach area on the property. It has a very gradual slop with a natural gravel base, great for young swimmer. The site has it own small beach, great for young children learning to swim. a dock with 8' feet of water, and a boat ramp for small boats. North Pond is about 2.5 miles long with 234 acres, with an active association to prrotect its recreational use. The lake level is dropped in the winter to limit the vegetation from growing near the shore. There is a small sandy beach area with gradual slop, great for young children. Our home 300 feet on the lake offering peace and privacy. Every room offer a view! 300 feet of frontage on lake, with dock, area to launch boat and beach area. Contact owner for details. Directly on the lake, very private with 300' of lake frontage. Plus there are 500+ acres of woods and walking trails behind the property. one unit in living room, 2nd unit on 2nd floor. They will help reduce temperature on hot days. it is year round home. Linens not provided. Guest will need to bring their own. There is fire wood on site. Guest is responsible to clean out fireplace it they use it. all appliances are just a year old. The Porch over looking the lake also serves as a dining room with a great view. Small 9' row boat, plus there are 2 older sail boards, that may be used as seat down paddle boards. The normal stay is 7 days from Saturday at 4PM to Saturday at 10AM. Possibility of winter rental from October to end of May. For rental application please send me an email with your HOME mailing address (postal NOT email) and your phone number. Please inquire for rates with well behaved dogs. .
Another great stay! water was in the mid 80's. Perfect combination of location, amenities, environment, and charm. From the substatial private lake frontage buffered on both sides by dense lush natural vegetation, to the daily frequent humming bird visits, this property was the ideal spot to just disconnect from our daily grind. My daughters, mother, and I had a wonderful stay at this cottage on North Pond. The cottage is twenty feet from the water and the views from the porch and master bedroom are gorgeous. Every morning, we were woken up to beautiful sunshine reflecting off the lake. (Bring an eye mask if you like to sleep in.) During the early mornings and weekday afternoons, the setting is very tranquil. During evenings and weekends, you'll be entertained by water skiers. There is a nice hiking trail down the street from the cottage. The host, Robert, was very friendly and welcoming. Yes we loved it. It was so peaceful and wonderful and what a great host Bob is! Loved it! Great spot for BBQs and kayaking and rest and fishing and relaxation! This was our 1st time renting at Bob & Nancy’s lake cottage and it was fantastic! The home and property are extremely clean and well-maintained, down to the interior of the bureau drawers. The cottage has a wonderful vibe. It feels … HAPPY. There are grapevines blooming near the upper hill and shed/parking area, and the lawn is expansive. The street is a dead-end, windy but quiet and great for walks/bikes or to cross and head up the trails of Peppercorn Hill. You can barely see the neighbors to either side, but we did run into them walking and biking and they were extremely nice and fun to chat with. The water (late July) was perfect - warm, clean, and welcoming. We fished (quite successfully), paddle boarded around the lake, went tubing with friends who live on the Hopkinton side (aka Lake Maspenock), watched boats, kayaks and swimmers go by, and had an absolutely superlative time. At night we sat outdoors, fireside, watching the moon over the lake. The stars are quite visible as there are no street lights, and it’s far nicer that way. Indoors, the beds were all comfortable, with a charming master bedroom on the 1st floor with a deck, table, and loungers. The living room has a comfortable sectional large enough for several guests and a huge leather chair. Between that and the large screened in porch, there is ample indoor lounge seating and the seating easily triples if you include the outdoor seating. The kitchen, though small, has all the modern conveniences required for a simple meal and all of the tools and cookware needed for a family of 4. We cooked, baked, and fed two hungry boys no problem. Additionally, we hosted extended family for a BBQ one afternoon and with the large propane grill (plus the option for a charcoal one if needed/desired), there was plenty of room to cook. Wifi worked perfectly, if you can’t unplug. Logistics are super easy: Bait/fishing store ~ 10 minutes away, 15 minutes for the local and HUGE Price Chopper grocery store. My boys have celiac (no gluten) and it was as easy if not easier than NYC to keep them fed and happy with lots of choices. Bob & Nancy are very considerate hosts who have clearly put much thought into ensuring that this cottage has everything that is necessary and nothing that isn’t. When you are here, you feel so peaceful. We can’t wait to return next year! This is a nice retreat to a clean, warm lake. Our kids enjoyed the dock where they swam, fished, and paddle boarded. This is a great little hidden gem. I hope to be back one day. Reservation start on June 6, to the middle of October. At least 5 days stay is required. There are reports that it is great lake for large and small bass It is about 25 minutes to Worcester, 45 minutes to Boston & Providence, 35 minutes to Old Sturbridge Village and Blackstone Valley National Heritage Corridor. Southwick Zoo in Mendon, New England's finest zoo, is 10 miles away. There are many Golf Course and restaurants close by. Brimfield Flea Market 30 min. away. Abutting to rear on the property is Peppercorn Hill with many miles of walking and Mt Biking trails. Upton has many historic buildings and sites. There are some hidden historic Indian sites and some beehive cave chambers. On a clear fall day, you can see the tip of the Boston sky line from Peppercorn Hill.